March 16th 1968 will be forever remembered as one of the most shameful periods in American military history. 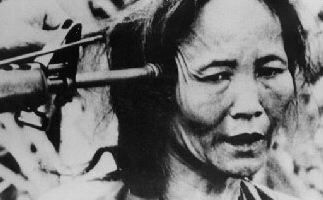 In two parts of the small village of Son Mÿ in Quàng Ngâi Province between 347 and 500 unarmed civilians were murdered. The dead included men, women and children. Many women were gang-raped before their bodies were mutilated and left to rot. US Intelligence had marked the area as a Viet Cong stronghold, codenamed Pinkville it lay six miles northeast of Quang Ngai and the previous month a company from the US Eleventh Brigade had pushed through the area and suffered a number of casualties. By March of 1968 the US Army were actively trying to assert a strategic initiative in the South by increasing the number of small units carrying out ‘search and destroy’ missions. Task Force Barker, led by Lieutenant Colonel Frank Barker was made up of three rifle companies from the 11th Brigade and C Company from the 20th Infantry. Shortly before the attacks the soldiers were told by Colonel Oran K. Henderson of the 11th Brigade to vigorously attack and eliminate ‘for good’ any of the local Viet Cong force whilst LC Barker was said to have instructed his unit to destroy all of the houses along with all food supplies and livestock. Over in Charlie Company, the commanding officer, Ernest Medina told the soldiers that most of the civilians would be at the local market meaning that any left could be considered sympathisers of the NLF. William Calley JR, a platoon leader in C Company was, according to one soldier, instructing his men to destroy anything and anyone which ‘walked, crawled or grew’. The scene was set. The Saturday morning of the offensive saw some one hundred soldiers from C Company sweep through the village areas meeting no resistance. As villagers prepared to go to the market or worked in the paddy fields they were met by soldiers who began shooting and stabbing the unarmed civilians. 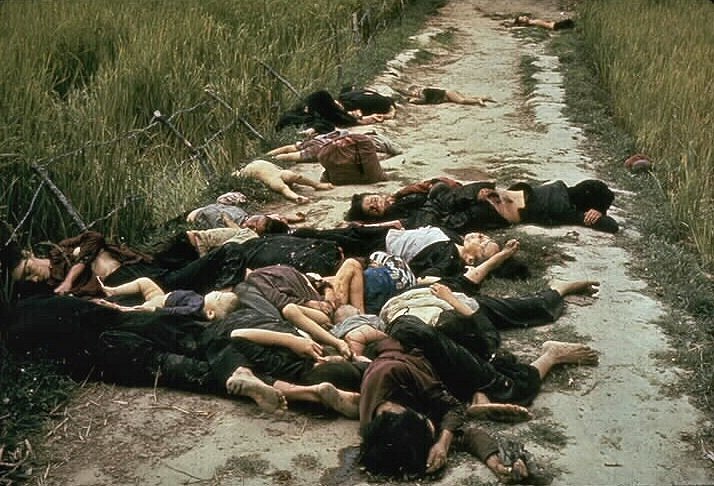 In eye-witness reports by US soldiers some villagers were thrown down wells accompanied by a grenade blast, women and children who had been rounded up and knelt crying and praying were shot in the head. On Calley’s instruction some eighty villagers were marched to an open ditch and shot dead. Women, clutching on to their babies were killed by the bullets passing through their child who were thought to be housing grenades. Some threw themselves upon their children to shield them from attack but it did no more than delay the inevitable by a matter of moments. Those children old enough to walk alone were shot on Calley’s orders whilst their homes were torched and bullets flew indiscriminately across pens of livestock killing anything which moved. It was a scene of utter devastation fuelled by an overwhelming paranoia on the part of the officers. Back-up battalions continued the killing spree until a helicopter pilot, Warrant Officer Hugh Thompson who saw the killings whilst on a routine reconnaissance mission landed his helicopter between soldiers and villagers fleeing the scene. Thompson threatened to open fire on the soldiers unless they stopped and what followed was another shameful cover-up by the army hierarchy who declared an operation in which ‘120 communists were killed in battle’ a great success. For almost a year the deception held with principle players even awarded medals for their role in the massacre. It wasn’t until one soldier, Ron Ridenhour from the 11th Brigade who had heard about but not taken part in the killings set about making it known to America’s most senior politicians, chiefs of staffs and even President Nixon. Finally, when none of them would acknowledge his claims he turned to the journalist Seymour Hersch ( later of President Kennedy fame) who ran the story in November 1969 via the St. Louis Post-Dispatch. The subsequent enquiry and attempts to cover up the atrocities infuriated an American public already vehemently opposed to the war. When the enquiry recommended that twenty officers be charged with offences against the Geneva Convention only fourteen were charged and later acquitted. Only Calley stood trial and was sentenced to life imprisonment for premeditated murder. A sentence for a man considered a scapegoat even that became farcical with his life term reduced to twenty years and then ten before being released on parole three years later in 1974. Thompson, for his part received death threats upon returning home. He made a number of drops during the shootings to rescue children from bunkers who officers had wanted to ‘coax out with a grenade’. His actions led to his receiving the Distinguished Flying Cross which he threw away when the citation read he had rescued the children under intense crossfire. In 1998 he and the rest of his crew were awarded the Soldiers Medal, an award for bravery not involving direct contact with the enemy. Still, the Army wanted to present it privately but Thompson insisted it be done in public in order to recognise once again the reason for the award. US Army personnel took a number of photographs during the operation but a great many were destroyed, the majority of which were of American soldiers carrying out the killings. It marked an episode which further divided loyalties within the army and the public. It was further proof, if it was needed of what one human being is capable of doing to another in the name of war and it achieved nothing other than increasing the sense of hatred towards America and its foreign policy.